I am extremely excited to bring you these Instant Pot Chicken Shawarma Lettuce Cups. Not only is this recipe quick and easy, but it’s my first self-developed IP chicken recipe. So it’s pretty special. When the Instant Pot first came out, you would’ve had a hard time convincing me that I’d eventually jump onto that bandwagon. Aside from the fact that I was living a pescetarian lifestyle at the time, there was the fact that the IP seemed marketed toward busy mom’s desperate for a quick weeknight dinner solution. I eventually phased poultry back into my diet and, soon after that, learned that quick weeknight dinner solutions were also a godsend to childless creatives that work at home—like myself—because seriously. Who doesn’t love a quick dinner. Ease and simplicity isn’t exclusive and I have no idea what world my head was floating in, but I’m glad I’ve grounded it. Instant Pot Chicken Shawarma Lettuce Cups. The first few recipes I made in the Instant Pot were extremely watery and left me feeling defeated. I remember having to remove the meat, hit the sauté function, and stir in a slurry to thicken the sauce. Unlike with a slow cooker, the liquid in a pressure cooker doesn’t evaporate and reduce—so you won’t end up with a thick, gooey, sticky, beautiful mess. With that in mind, if you use too much liquid you end up with a watery, flavorless bath. The rule of thumb with the Instant Pot seems to suggest a minimum of 1 cup of liquid, but I’ve learned that 1/2 cup of liquid will indeed work, and I’ve been sticking with that so far. It’s worked perfectly for this recipe. You’re presented with just a bit of liquid upon opening the lid when done, and once you shred the chicken, stir it, and let it sit for a few minutes, the shredded chicken soaks up all of that saucy goodness. The original recipe for IP chicken shawarma I found worked as a wonderful guide—but there were a few spices missing in the mix, like cardamom and all spice. After doing some research, I was able to come up with this concoction and I think it worked out really well in comparison to some of the shawarma I’ve had at middle eastern restaurants. You surely don’t have to limit yourself to lettuce cups. Snuggle it into a wrap, lay it over a pita, or dump it onto a salad—it’s all delicious! Right now, my husband and I are in “I want to fit into this shirt/these pants again” mode, so we’re inching back on snacks and bad habits and trying to eat lighter with more proteins and veggies. Load up on fresh ingredients. 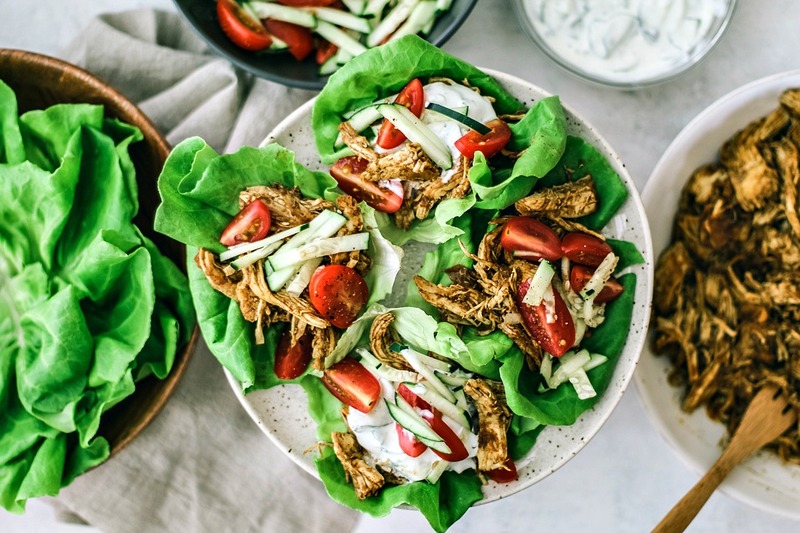 Instant Pot Chicken Shawarma Lettuce Cups are a great way to kick things up a notch during the week. They're fast, easy, and super nutritious. 3 lbs chicken, boneless and skinless Can be thighs or breasts; look for cruelty-free ethically-raised. Place the chicken and the onions in a large freezer bag or plastic container; set aside. Place the olive oil, lemon juice, garlic, and all of the spices into a large bowl and whisk until the mixture is well blended. Carefully pour the mixture into the bag or container, over the chicken. Seal the bag or container, then mix and shake until the chicken and onions are well coated. Transfer the chicken and onions into your Instant Pot and mix things around to ensure even coverage. Close the lid (follow the manufacturer's guide for instructions if needed). Set the Instant Pot to the Manual setting, and set the timer to 8 minutes on high pressure. In the meantime, prep your tomatoes and cucumbers. When the Instant Pot cycle is done, wait until the natural release cycle is complete—this should take about 15 minutes. (If you're in a rush, check the manufacturer's manual for quick release.) Carefully unlock and remove the lid from the Instant Pot. Let the steam release itself. When done and when safe, take two forks and shred the chicken so it resembles pulled chicken. Stir the chicken around to coat and let it sit for a few minutes to soak up the sauce. Serve with lettuce cups, tomatoes, cucumbers, and tzatziki or hummus. This recipe is SOOOO GOOD! On repeat weekly at our place, if there are any leftovers they’re even better the 2nd day. We love it on a bed of chopped butter lettuce with sautéed zucchini or string beans w:a dollop of homemade coconut yogurt tzatziki. Thank you for this phenomenal recipe! This was my second instant pot attempt. So flavorful and delicious! Huge home run for my family. Especially good wrapped in lettuce. I will be trying more of your recipes. Thank you! Hey Jenna! I'm so glad you and your family enjoyed this. It's definitely a favorite in this house :) Thanks so much for taking the time to come back and leave some feedback! I hope you find more recipes here to enjoy! Hi Sandra; you can definitely leave out the cayenne. The amount used in this recipe only brings a slight kick, but it won't change the flavor profile if it's completely omitted--so you're good to go! What a great sounding recipe and I simply love using lettuce cups and serving bowls. I used to have an old fashion pressure cooker -- in fact I had two. I don't know what happened to them. I said I wasn't going to get an Instant Pot but everytime I see a delicious dish like this I'm tempted. I'm saving this recipe -- just in case. Thanks, Marisa! I always said I'd never get an IP—mostly due to fear and paranoia since I've read some scary things about the "old school" pressure cookers. I thought, "What if it blows up? What if I lose an eye? What if… ?" But, the IP is super safe and technologically advanced so I'm pretty comfortable with it. (Though the first few times I went to release the pressure, I did it standing as far back as I could with the end of a wooden spoon, hitting it in nervous spurts and backing away. It probably looked like I was fencing... lol). I have been SO HUNGRY when I've seen these chicken lettuce cups on social media. What a fantastic recipe for the Instant Pot! The Chicken Shawarma must be SO flavorful cooked this way and the drizzle of tzatziki on top must be the perfect accompaniment. What a great way to cook with the Instant Pot for a healthy, restaurant-quality dish. Giiiirl, that chicken looks like perfection! I still don't have an IP, but my momma does. I need to go visit and make this. The chicken looks so tender, and all those spices are fabulous. And I do love a good lettuce wrap!! I hope you love it! Lettuce wraps always seem like such a snore at first blush, but when you bite into them? MAGIC. Welcome back to the world of chicken! And congrats on your first Instant Pot recipe! I too thought I wouldn't get on the IP bandwagon, but looks like we're going to be getting one soon!! Pinning this to try! Thanks girl! I'm glad you're hopping onto the IP train. I think you'll love it! I hope you and your fam dig this recipe as much as we did. It's definitely going to become a regular thing here. SO GOOD. Awesome! I am new to insta pot and don't have many recipes that everyone likes. We love shwarma so I am so excited to try this. The spices sounds perfect and I love how quick this comes together plus the suggestions of healthier options for wrapping. Thank you. I hope everyone loves this as much as we did, Debra! Oh my goodness. When I saw the video playing on my Facebook feed, I was READY to try this! This looks AMAZING. I can't believe this is your first IP recipe on the blog. I love that you used lettuce cups instead of pitas because I'm trying to cut down my carb intake but I loooove shawarmas so this is the perfect alternative. This recipe is right up my alley. I'm a sucker for a good instant pot recipe. I need to eat less grains and this looks like the perfect easy recipe that is full of flavor! Do you think after I add the chicken and other ingredients to the ziplock I could freeze a few to cut down on my prep? Hi Jennifer! Do you mean make extra batches to freeze in advance? If so, then you could totally do that, but make sure to thaw the chicken prior to putting it in the Instant Pot. I have a brand new 6 qt instant pot. can I halve this recipe and, if so, do I have to adjust cooking time? thank you!! Thank you for the immediate reply! This is now part of my weekend cooking plan! I can't wait to hear how it goes! And welcome to the Instant Pot tribe ;) Have an awesome weekend! My husband and I recently agreed that we need to start eating healthier because there's an entire side of our closet that we can't fit into right now, so I really appreciate the healthy nature of this shwarma. The lettuce cups are genius and I think it would be great on a kale salad, too. I don't have an Instant pot (only person on the planet who doesn't). Are there any changes I should make if I do this in my dutch oven? Would appreciate your tips. Haha, I'm glad we're not alone ;) Also! Thanks for reminding me: I meant to write a little blurb for folks without an Instant Pot. So I'm going to add that in here today. But to answer your question—I'd go ahead and dump the chicken and sauce into your Dutch oven and bake at the temp and time you normally would for poultry. Once it's done, you could remove the chicken and roughly chop it or even cube it, toss it in what sauce is leftover, and serve it that way. If you do try it, please let me know. I'd love to know if it works well. Thanks, Lisa! I would devour these for lunch or dinner. This is the perfect meal to feed a crowd. Love this chicken recipe...and since I don't have an Instant Pot, I will try to make this in my regular pressure cooker. Hi Gloria! You should have no problems doing this in your pressure cooker. Please let me know how they turn out. I hope you love them!